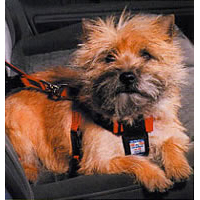 The Hi-Craft Dog Car Harness is the Original Safety Dog Harness with over 3 million harnesses sold to owners worldwide! Under heavy braking or in an accident your dogs weight is absorbed across the shoulders and through the padded chest piece, except for the extra small car harness that does not require padding. The safety car dog harness manufactured by Hi-Craft prevents your dog from being forced forward during an emergency stop, this helps to prevent injury to both your dog and other passengers in the car, as your dog is securely fastened to a rear seat belt by threading your cars seat belt through the car harness loop, restraining your dogs movement in the event of an accident or hard braking, in much the same way as a conventional passenger seat belt would for a person. Using a car harness will make journeys a safer experience for both your dog and passengers alike, but also help drivers to concentrate on driving, minimising distraction and increasing visibility by keeping your dog under control in the car. The Hi-Craft Dog Car Harness is fully adjustable with quick fastening click buckles and allows your dog freedom to sit, turn around or lie down on the seat and the swivel mechanism stops the harness for becoming entangled, whilst giving your dog sufficient freedom to move in the car with ease or without stress. Why owners should use a dog car harness? Safety Car Harness: 5 stars out of 5 based on 12 user reviews. The harness has already proved to be a real asset for keeping me safe when I am in the car. It makes car travel a dream! I also enjoy wearing it on walks, and when I want to dive into snow drifts and dig up mole hills. It is extremely comfortable around my chest as a result of the adjustable fittings. It also looks very stylish in red and black. Flint, the Border Collie. This is my third dog and all have travelled with me extensively by car. 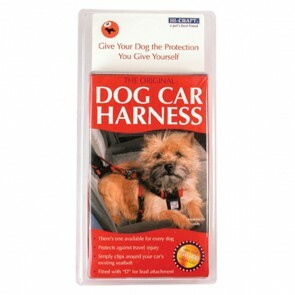 All have been secured using this harness as quite simply it is the best car harness available. This time I bought two the extra small as Archie is still a puppy and a medium for him to grow into. Both arrived within 3 or 4 working days by Royal Mail. So much easier for collecting deliveries than courier companies. I would definitely order from here again. Fast delivery excellent product would recommend I am using xs for my 15 week old cockerpoo puppy and it fits well. An excellent product and excellent service from Valupets - delivered within two days. Highly recommended! This is without doubt an excellent harness. It is very easy to use, very strong, and comfortable for the dog. I have just bought another as I am concerned that when my current one wears out the brand may not be available in the future, I have seen others in use and they are not a patch on the Hi-Craft version. Thank you for the excellent service! The harness is just what I need. I ordered this from another website and they sent the wrong thing and I am still waiting for a refund! So this was a comparable transaction with 5 stars! Great product and excellent service, many thanks! spot-on service and delivery. The harness is easy to use and looks very comfy on the dog. Recommended and the price is very good too. THIRD TIME OF USING THIS STORE - HIGHLY RECOMMEND THEM AND WILL CERTAINLY BE GOING AGAIN. DELIVERY ABSOLUTELY EXCELLENT AND THE PRODUCT IS JUST WHAT I WANT. Brilliant service, would definitely recommend this seller + dog harness is great success.